The Britannia Youngstown home sale price per square foot has had a very strong third quarter of 2012, Brittania Youngstown has sold for $324 per square foot in that quarter. The average in Britannia Youngstown has slipped in October, but that is only based on 2 house sales. 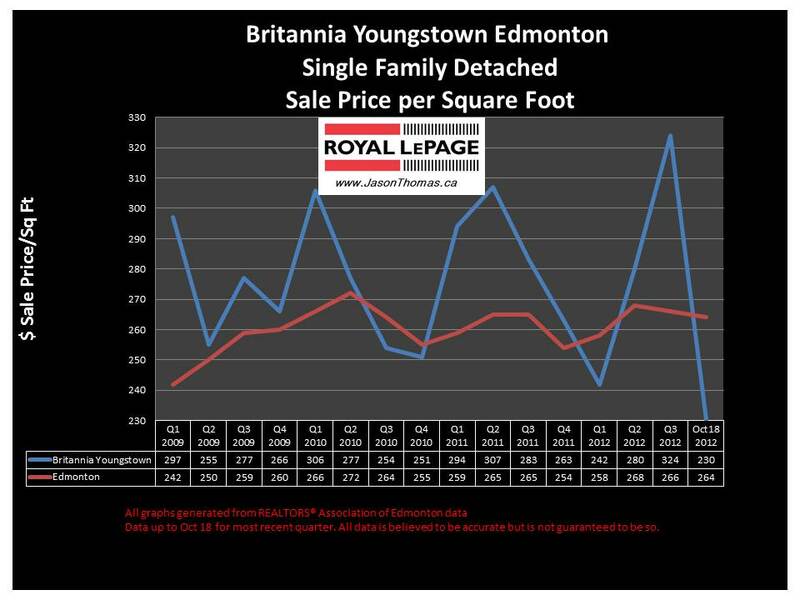 The sale price per square foot for houses in Britannia Youngstown has been fairly volatile, the average selling price per square foot year to date has been $269. That is a few dollars higher than the Edmonton average sold price per square foot in 2012 of $265. The highest sale price for a home in Britannia Youngstown this year has been $349,000. The lowest selling price for a house in Brittania Youngstown so far in 2012 is $203,500. The average time to sell a home in Britannia Youngstown this year has been 34 days. That is faster than the Edmonton average days on market of 46 in 2012.